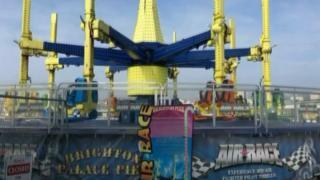 One person was injured when part of a fairground ride on Brighton Palace Pier came loose and hit them. Pier chief executive Anne Ackford said part of the Air Race ride had become detached and had struck a passer-by. Ambulance crews said one person was taken to hospital with a leg injury. Paramedics checked others over for shock. Ms Ackford said: "We have been in immediate contact with the manufacturer to ask them... to investigate." A spokeswoman for the Health and Safety Executive (HSE) said: "The HSE is aware and we are investigating the incident." Ms Ackford said the pier's organisers would "co-operate fully with any investigation". On the pier website, the publicity for the ride promises visitors they will "race through the skies on this thrilling motion ride which guarantees to send your pulse racing". East Sussex Fire and Rescue Service said it was called to the pier to assist ambulance crews but firefighters had left the scene. South East Ambulance Service tweeted there had been reports that "a piece of a ride had come loose" and a teenager had been taken to hospital with a leg injury. "Others were shaken but uninjured."